At the Lazy T Ranch, we have facilities for any kind of activity or event that you or your group are planning. Our facilities are handicapped accessible, and there is ample parking for even the largest groups. Tallgrass Arena - can accommodate more than 300 people. Cowboy Café - available for receptions and will accommodate up to 50 people seated or 100 standing. Guest House - available for parties or for a bridal preparation area for weddings on the ranch and also for overnight lodging. Guest House Lawn - also makes a nice location for a wedding or other event. Gazebo - makes a lovely setting for a wedding ceremony as well, with the native prairie Pathfinder Meadow for a backdrop. Sugarloaf Hill - great views over the Kansas River Valley and Manhattan area. Celebration Point - higher, majestic site in native prairie, also fantastic views over the Kansas River Valley and Manhattan area; where explorers came to the area before the founding of Manhattan, former home to Native Americans and buffalo. Prairie Pavilion - an enclosed building, with views of trees on two sides and the Pathfinder Meadow behind. Bluestem Barn - open on one side to a row of trees and native prairie meadow behind. Great for barn parties or any event, a very large building to accommodate any size gathering. Tallgrass Arena is decorated with a canopy of lights. We are available to cater your event as well and also allow other caterers. Decorations also are important to any event, and you are welcome to decorate for the event yourself, or we will help with whatever you need. 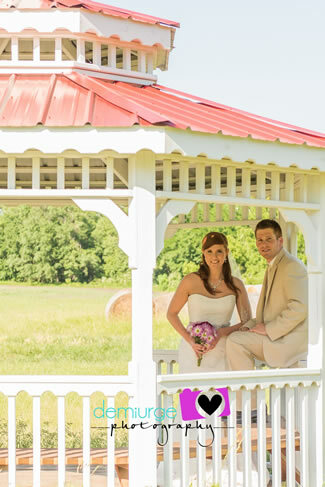 We have bridal archways, tents, and other items available. Wedding packages are available and include the use of a ceremony site, reception location and use of the guest house for two nights.